The Legal Genealogist most certainly is, without a doubt, a law geek. And I am totally geeking out over yesterday’s announcement by the Law Library of Congress and the legal publishing company William S. Hein & Co., Inc. that Hein is making a whole bunch of federal legal resources available online, in digital format. 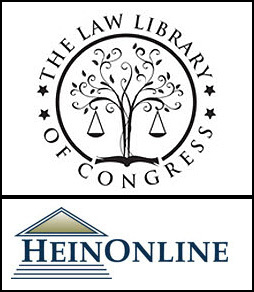 The publisher has a subscription-based online legal research portal called HeinOnline. • We’re getting all of the federal statutes — the United States Code — as those statutes existed between 1925 and 1988. Need to know what a specific tax law said in 1934? No problem. Head over to the Law Library of Congress’ Guide to Law Online: United States Law, click on the link for United States Code (HeinOnline) 1925-1988, or go directly to the page for the United States Code. Then choose the code for 1934, open the first link for Titles 1-50, open the file for Title 26 (for Internal Revenue) and have at it. • We’re getting all of the opinions of the United States Supreme Court — the United States Reports v. 1-542 from 1754-2004. Want to read, say, the opinion of the Court when it said Texas never had the right to secede from the Union? The case is Texas v. White, reported at 74 U.S. 700 (1869), so go to the Guide to Law Online: United States Judiciary link, and click on the United States Reports (HeinOnline) v. 1-542 (1754-2004) link, or go directly to the United States Reports v. 1-542 page. Then scroll to volume 74, click on the link and scroll down to page 700 where the case begins. • We’re getting all of the administrative agency rules and regulations — the Code of Federal Regulations for the years 1938-1995. So if an ancestor was buried in a national cemetery in 1938 and you want to know what the rules were then, you could go to the Guide to Law Online: Executive, click on the link for the Code of Federal Regulations (HeinOnline) 1938-1995 or go directly to the Code of Federal Regulations page. Then scroll down to 1938 and choose that, then scroll to the index for Titles 36-41, and when it opens, choose the file for National Cemetery Regulations. These databases are, again, being offered completely free. The only restriction is that we can only download 20 pages at a time in a PDF format. Other than that, it’s wide open access. And, by the way, there’s a lot more to HeinOnline for the genealogist than these free databases. It’s the best online resource that exists for historical statutory research. It’s not cheap, but you can get a short-term subscription to the Session Law Library which has all of the statutes of all of the states right back to their inception. The price tag is $29.95 for 24 hours, $44.95 for 48 hours and $64.95 for a week, but if you absolutely have to have that copy of that statute and there’s nowhere else where you can access it without traveling, it may well be worth it. In the meantime, go play around in the federal legal resources Hein is making available to us all through the Law Library of Congress. The feeds from the LoC are priceless. Since I am just a short bike ride to the bridge to the swamp, I can sojourn over to the swamp for so many peeks at legal documents. The local law school is also generaous with time on database foraging with an ID. However, it does not help the genealogist who likes to stay in her jammies into long night searches. Heinline, and LoC have been invaluable to me in my work on ‘trial histories’. Along with google books for compediums and state reports…welll the list goes on. Many an obscure person has been uncovered and illuminated. The list does indeed go on and on — and aren’t we glad it does! I can’t thank you enough for all your knowledge and the information you so graciously share with all of us genealogists. Whether you are giving a presentation or writing an article, I really appreciate you explaining what the Law terms are in a simple version. You’re amazing! Thanks so much for the kind words. They’re much appreciated. These works are all in the public domain and belong to us. Why are downloads limited to 20 pages at a time? Is it a technical issue? If so, will they make entire volumes available as PDFs some day? In part it may be technical, since HeinOnline limits downloads even to its subscription customers. In part I assume it’s proprietary: these items may be public domain, but these copies of these items belong to the company and it has the right to set terms and conditions on making its copies available. Your presentations and webinars have highlighted the value of consulting these statutes. So thanks for sharing this wonderful news that the historic federal statutes and decisions will be made available for free. To those of us living four hrs drive from the nearest fed law library, this is wonderful news. Thanks for sharing the news. And thanks for the info on short term paid access to the state statutes. Happy to be able to pass on the news, Anna! So glad you posted this … my geeky law-loving heart is full indeed. Thanks Judy! Glad to point you in this direction, Jenny!